A bronze statue of a woman sits alone on a stone bench in Liverpool’s Stanley Street. She appears to be middle-aged, tired, worn down by life. Her small handbag sits carelessly in her lap and she seems to be gazing down wistfully to her left at a sparrow that’s perched on a rumpled newspaper. Her left hand rests on her knee; she looks cold but, even so, perhaps she has nodded off while she was reading. A partially empty shopping bag lies on the bench to her right. As you get closer, you notice that the woman only has the merest hint of a face. 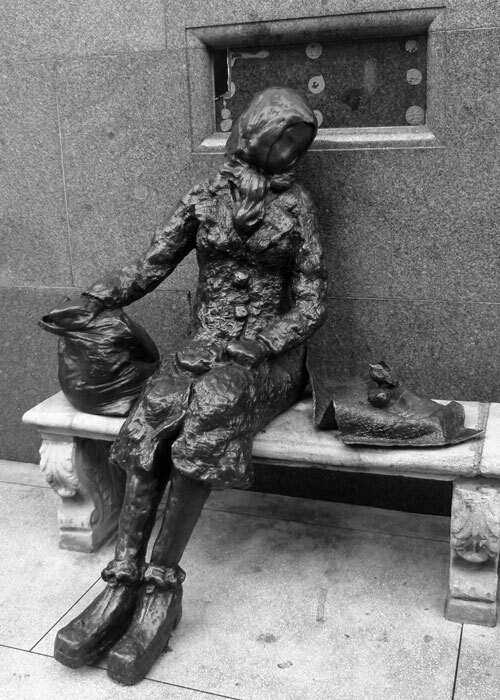 This is Eleanor Rigby, the statue, a slightly spooky and bleak image that fits a slightly bleak song by the Beatles, and its slightly spooky mythology. The statue (which, in case anyone’s interested, I think is brilliant) is the work of entertainer Tommy Steele. It was his own tribute to the Beatles and was unveiled by him in December 1982. The plaque had been stolen by someone else before I got there, but dedicates the sculpture to “All the lonely people”. The Beatles released Eleanor Rigby as a single with the relatively awful Yellow Submarine in August 1966. It stayed in the UK charts for 13 weeks, four of those at No 1. 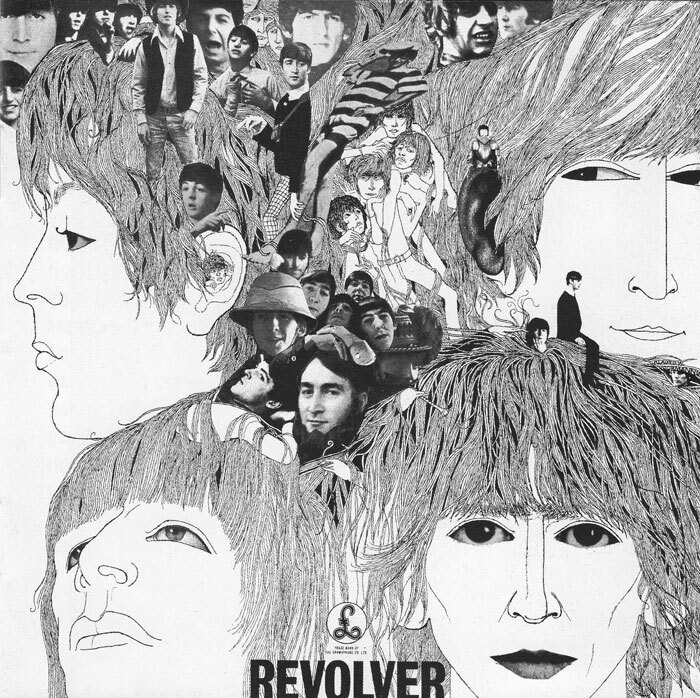 The album Revolver came out at the same time as the single and featured Eleanor Rigby as the second track; Paul’s velvety vocal and the backing of see-sawing strings leaps in without warning after George’s staccato studio-coughing Taxman. Eleanor Rigby is a haunting, sad, song, a little over 2 minutes in length. Like so many Beatles’ numbers, its origin, conception and subsequent development is the stuff of pop legend. Paul McCartney first came up with the tune that became Eleanor Rigby in the little basement music room at girlfriend Jane Asher’s parents’ house, 57 Wimpole Street, London. The singer Donovan recalls Paul turning up with it at his flat where he sang, “Ola Na Tungee Blowing his mind in the dark/With a pipe full of clay/No one can say” – though some stories have the song starting life as “Daisy Hawkins” – which does not scan so well, if at all. Apparently, the song was finished at John Lennon’s Kenwood mansion, with input from the other three Beatles and Pete Shotton, John’s childhood friend. The ratio of input varies according to which account you read; I’ve always thought it was largely Paul’s composition, with John contributing the ‘Ah, look at all the lonely people’ line – which kind of sounds right. The ‘Father McKenzie’ referred to in the song, though, started out as ‘Father McCartney’. 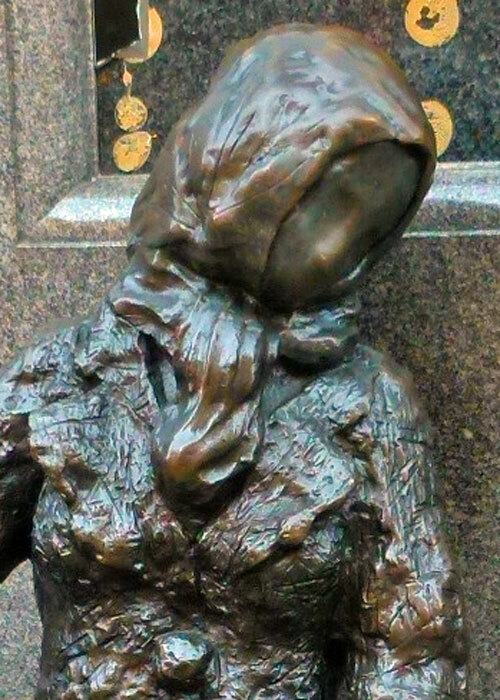 So who was Eleanor Rigby, this somewhat forlorn spinster who lived in a dream and was buried along with her name? Was she just a figment of imagination? According to Paul, the name was partly inspired by Eleanor Bron, actress and friend, who worked with the Beatles on the movie Help!. The ‘Rigby’ was spotted on a shop front in Bristol, where Paul was visiting Jane Asher whilst she was appearing in theatre there. 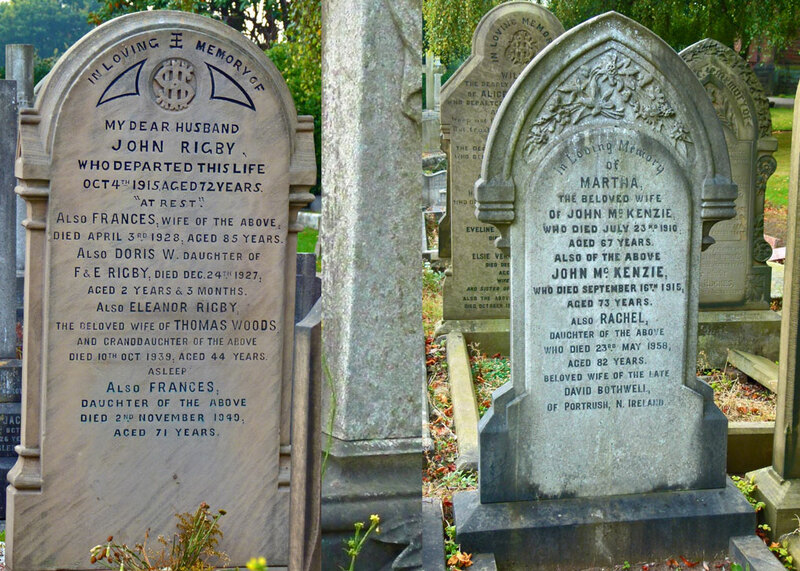 Yet, by spooky coincidence, in St Peter’s churchyard, Woolton, Liverpool, close to where Lennon and McCartney first met, is a memorial to Eleanor Rigby, who died on 10th October 1939. Could Paul – or even John – have subconsciously taken in the name? John, in particular, knew this churchyard well. Continuing the coincidence, a few gravestones away is a memorial to Martha and John McKenzie – is that also where Father McKenzie came in, or was he just a convenient name from the ‘phone book? Incidentally, Paul had a dog called Martha – he wrote a song about her too. In 2008, the Daily Mail carried an intriguing article which documented the real Eleanor Rigby’s life and family. Curiously, she was born and spent most of her life in a house in Vale Road, Woolton, which backs onto Menlove Avenue – where John Lennon grew up. 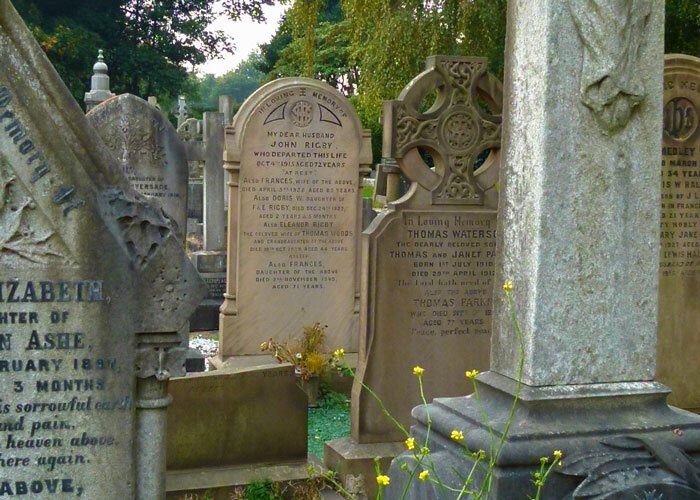 Weirdly, when we visited Woolton, a family was gathered at the Rigby grave and I’m sure I heard the woman telling her little girl that Eleanor was an old relative. 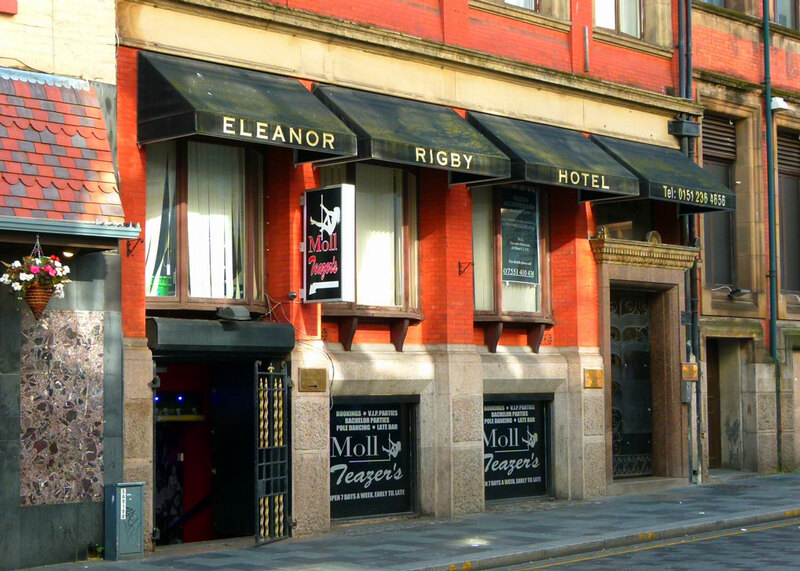 If you do the Beatles trail, you will want to include Eleanor Rigby. Next week, we might talk about JFK, Princess Di, alien abduction and crop circles. Meanwhile, I’ll leave you with a link to a YouTube clip of Paul McCartney performing Eleanor Rigby at the White House (the one in Washington DC) – the Beatles never performed the number live and the only instruments on the original were strings, played by session musicians. based on the song too. I should read that; thank you for popping in! I like Yellow Submarine! Oh well, very interesting post full of odd connections. Have seen the statue up close – it’s interesting and quite striking, but .. what happened to the feet..? They’re so all wrong!! A haunting and enigmatic quality to the song, amazingly matched by the statue. This is fascinating, Mike. I always thought they made it up! This adds so much more mystery and dimension to the story! It all sounds rather surreal.And strangely seedy and undeveloped, considering the Beatles Trail is so famous. I like your description because it sounded like the Liverpool that I always imagined the Beatles knew. Pubs and strippers and home made looking statues (you can see I don’t share your opinion of Tommy’s talent) and generally mad and fascinating. I didn’t see this when I was in Liverpool, darn. I should have consulted you first. A great article with some wonderful background. Next time, eh? Thank you so much for visiting and leaving a comment! A good excuse to return to this wonderful city. That is a fine sculpture. It is a shame the plaque has gone. What a moving statue. I guess she is faceless because all the lonely people are unseen too. yes I remember the song well, revolver is one of my favourites. good to know the background behind it. Love the sculpture and the song. Some amazing coincidence in this story. Cracking sculpture by TS. Multi talented. I like melancholy songs if they are really good. Yesterday is another classic. Your post is a great combination of information, speculation, and fun–I like the silly asides but I’m not sure I catch all of them! Probably just my awful sense of humour, Kerry 🙂 Thank you so much for visiting! Another interesting post Mike, thanks. I am very impressed with this post. I hadn’t known about Tommy Steele’s work which I, too, really like – especially as it illustrates one of my favourite Beatles’ songs. I also enjoy this take on your series. Always a lover of the Beatles. Saw the sculture when I was in Liverpool and was impressed that Tommy Steele was the sculptor although I had forgotten that until I read your post. I’m sure many people can relate to this song. After all, you don’t have to be alone to feel lonely. I think I can sing it from memory. Interesting and sad sculpture. I used to know the album backwards – it’s still one of my favourites. This is one of my favourite Beatles songs. Thank-you for this well-researched and illustrated post, Mike. I enjoyed discovering what might have been the subconscious background to the lyrics…great detective work. I love songwriters. They absorb so much around them and then incorporate it into their music without realizing it. Paul also said that “Let It Be” had nothing to do with the Virgin Mary yet these are the words that she said when the angel appeared to her and told her that she would be bringing the son of God into the world. Paul most likely didn’t want to get into any kind of religion debate with anyone! Thanks for showing us the gravestones that you mention! Wasn’t ‘Let it be’ about his mother, Mary? You’re probably right; John got into a bit of hot water over religion . That was my first thought too, but very possibly it’s just the shoes that are too big and she had no choice. Quite a story behind the song! I do like the sculpture.The vague face suits it. Quite an interesting ‘coincidence’ about the gravestones. I like the song that will now play in my head the rest of the afternoon. Something for Americans to contemplate as we approach Thanksgiving Day. In some ways, the many lonely people remain hidden from view and seldom attract our attention. Very sad. Good post, Mike. Fascinating… though now the song is an earworm in my head! I grew up with it and other Beatles songs. Yes, every Christmas was a new Beatles LP in our house! I love this post, Mike…our first daughter is named “Lennon”…need I say more?! A bit of a Beatles’ fan then?! Me too. This is so interesting, thank you! I love that very short but sad song.